I've been anticipating this post for over two years, as I have been in the process of writing my first book. I'm so excited to finally be able to share it with you! 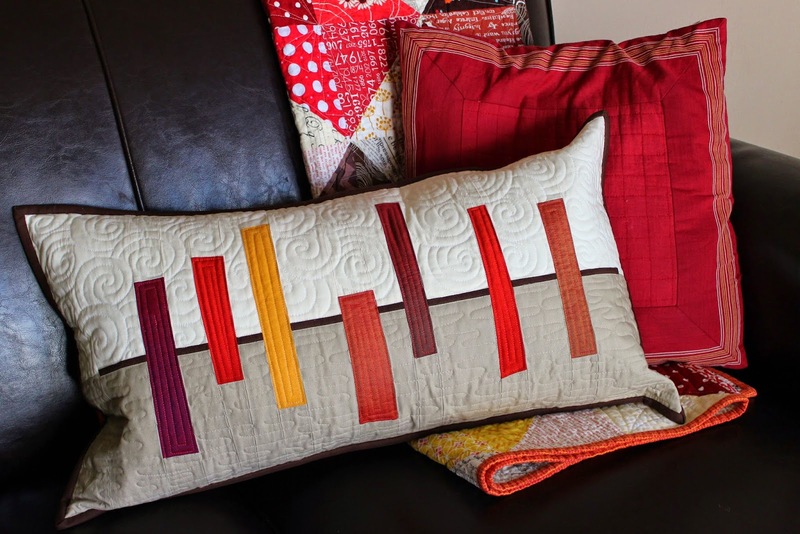 Improvising Tradition: 18 Quilted Projects Using Strips, Slices and Strata will be available November 27th. The book teaches several improvisational techniques, step by step, pairing them with traditional skills and methods. It is my hope that this book will give you the tools you need to create your own improvisational quilts, embracing an element of spontaneity while building on the traditional techniques you already know. I'm also thrilled to be able to give you some sneak peeks of projects in the book, over the coming weeks. The first is another shot of the cover quilt. 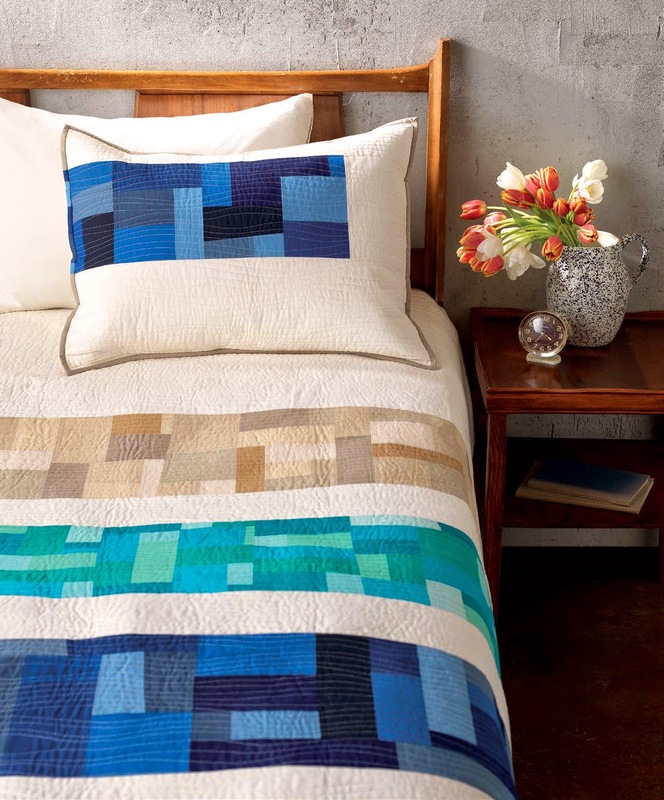 This is the Waterfall Quilt, along with its coordinating quilted sham. This project set is from the Strata section of the book. I've created a Facebook page for the book, if you'd like to stay up to speed on sneak peeks that way. You can count on updates across all social media platforms, and the links to all of mine are now in the right sidebar. 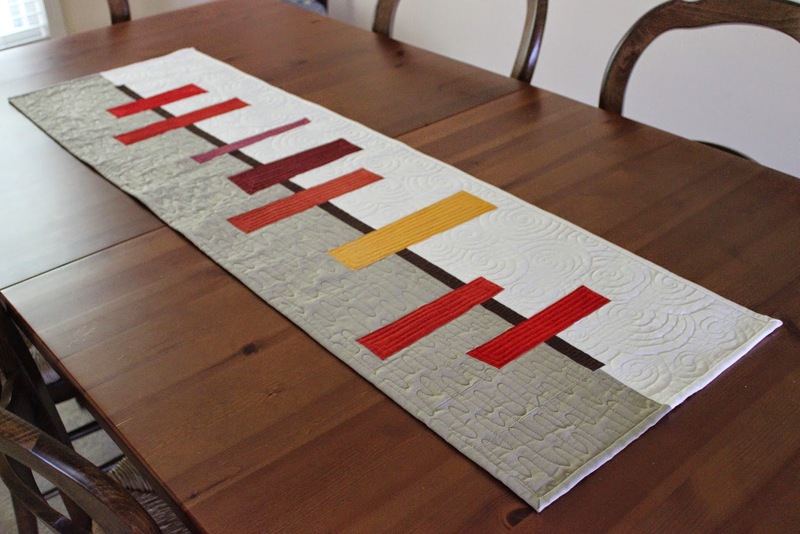 I made this improv table runner as a wedding gift for a good friend. 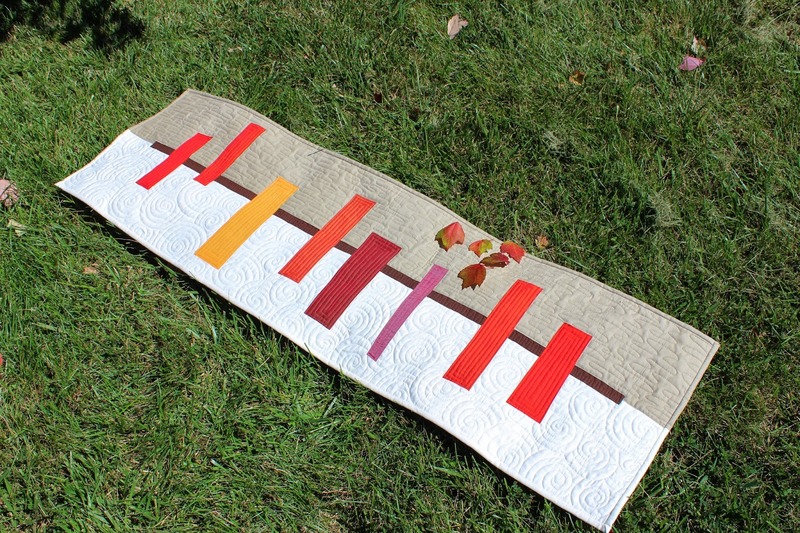 I wanted to use some gorgeous Oakshott scraps in fall colors, and that inspired me to divide the runner with a strip of brown, evoking a tree branch. The improv technique I used is a variation on slice and insert, and it creates some wonderful abstract shapes. My younger son informs me that "Abstract is when you get to make whatever you want - kind of like scribbles, but it is artwork." That's not too far off, and I'm a fan. 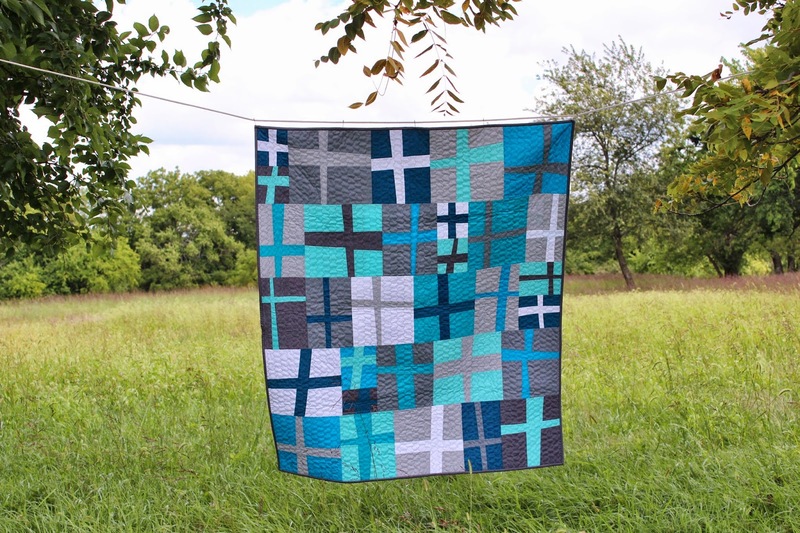 The blocks of color made it fun to quilt. 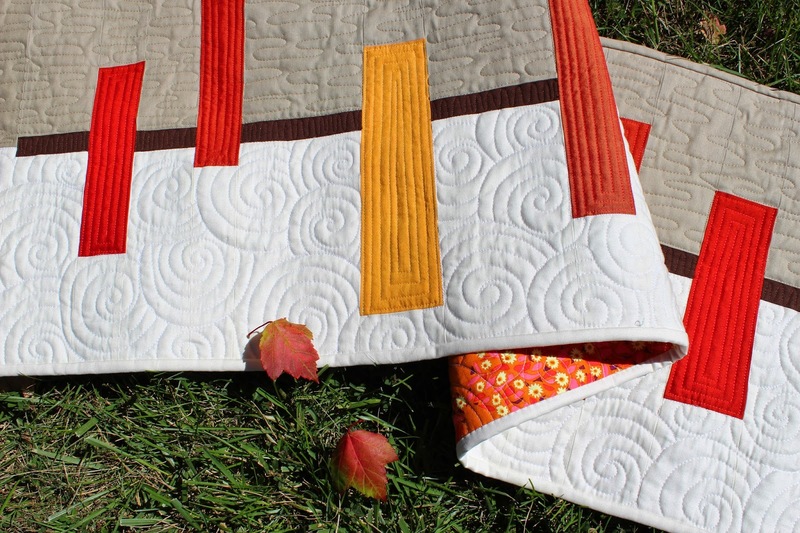 I emphasized the divide between the colors by quilting the cream in swirls and the tan in elongated meandering ripples. I did a simple rectangular spiral in each of the colored inserts. 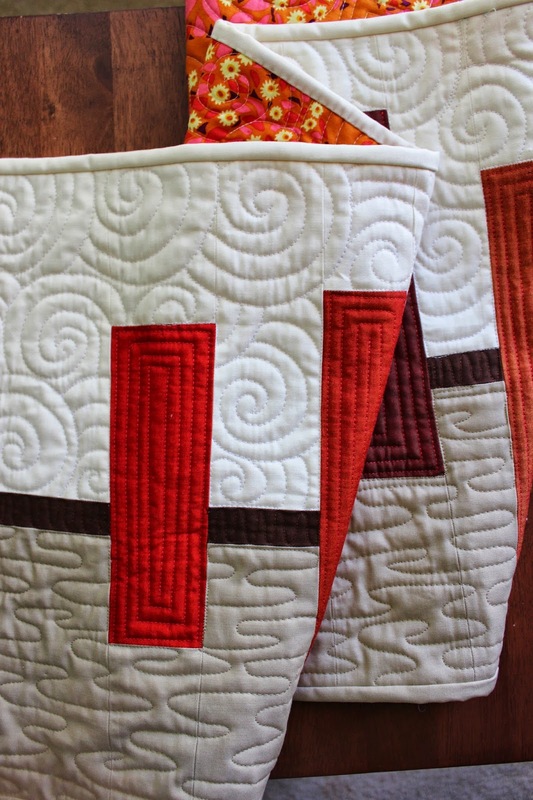 I made a pieced binding to continue the background colors in the runner. 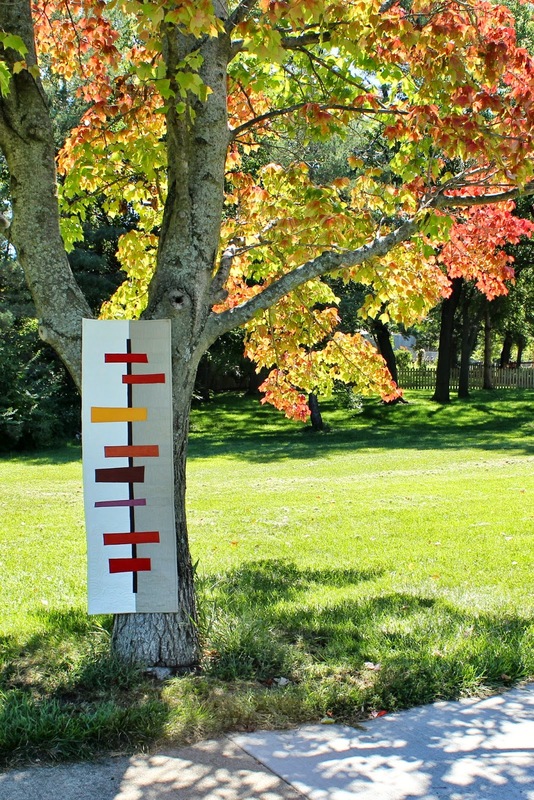 It makes the binding sort of disappear, leaving the focus on the fall colors. I was very tempted to keep the runner for myself, which I'm told is the sign of a good gift. I hope it will see many happy years in my friend's home. 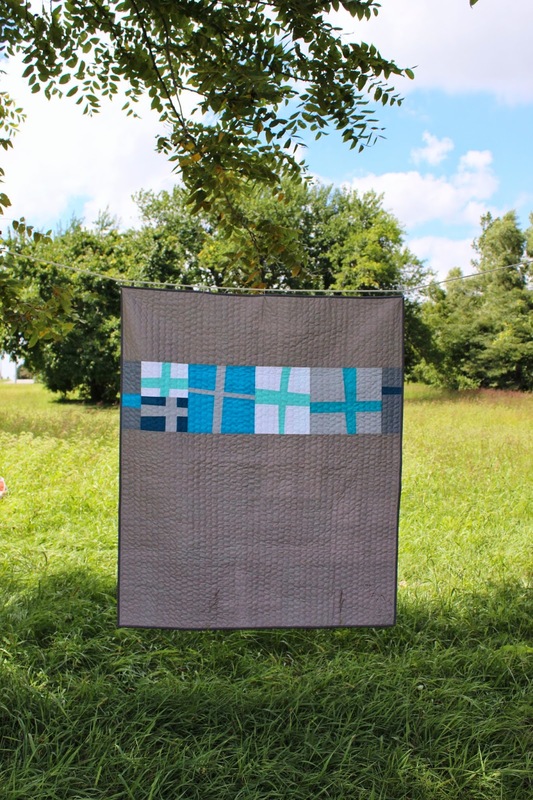 This 40 x 50 baby quilt is the product of my blocks from guild friends in the Whatever Bee. I made a practice wonky cross version (a maquette, if you will) a few months ago which helped me to identify the features I liked in this sort of a slice and insert block. 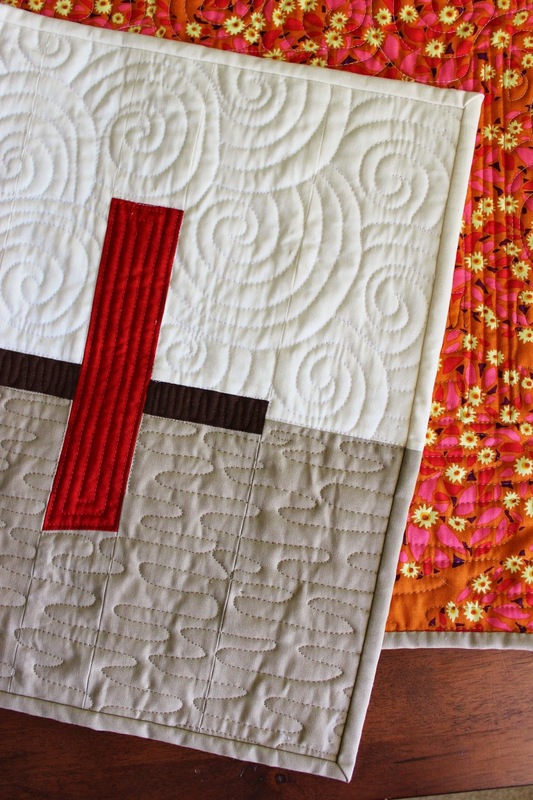 Like the practice quilt, I kept the blocks the same height but varied the widths. I also added a few half blocks and stacked them in pairs, just for fun (hint: this is a great fix for a block that may end up being slightly too small). 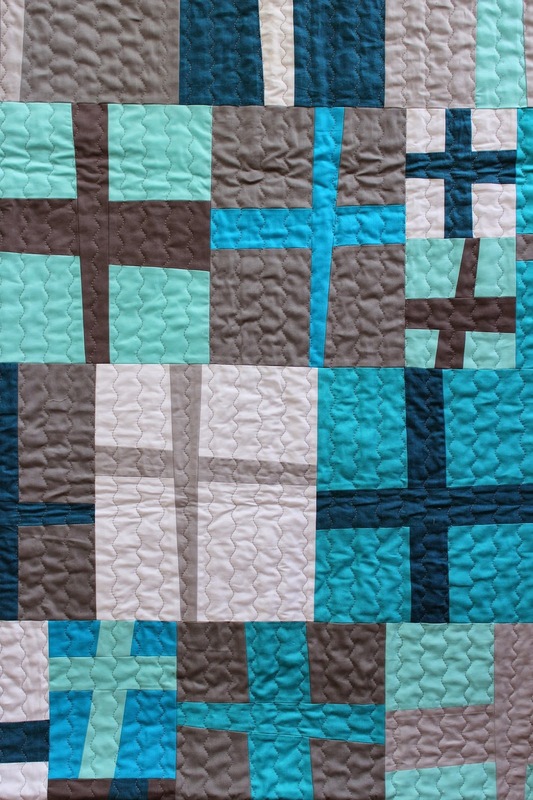 Improv quilting is awesome like that. 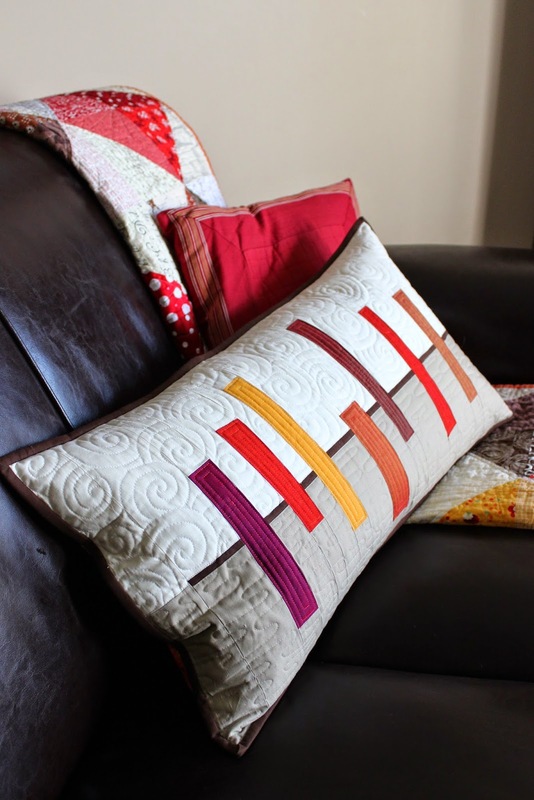 Here a fun tutorial by a guild member Carla on how to make this type of block, two at a time. I am donating this quilt to one of our guild's community service projects, Birthday Blessings, a local charity. 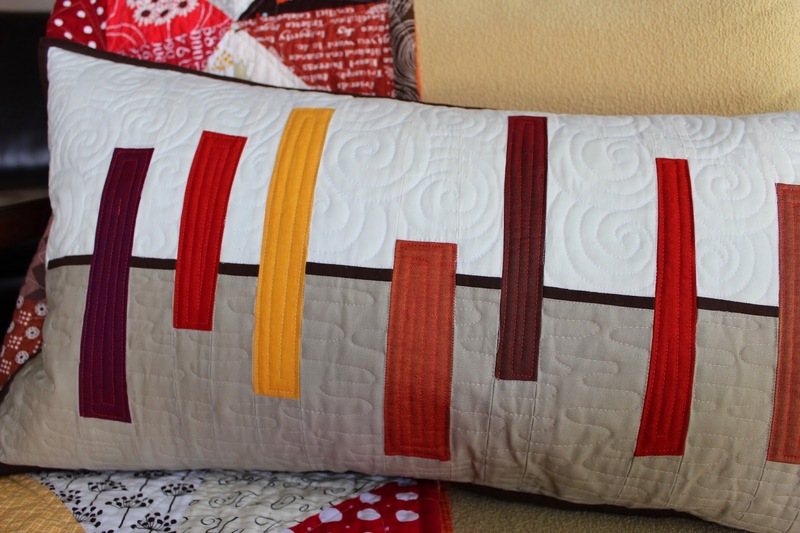 I am also submitting it to 100 Quilts For Kids. 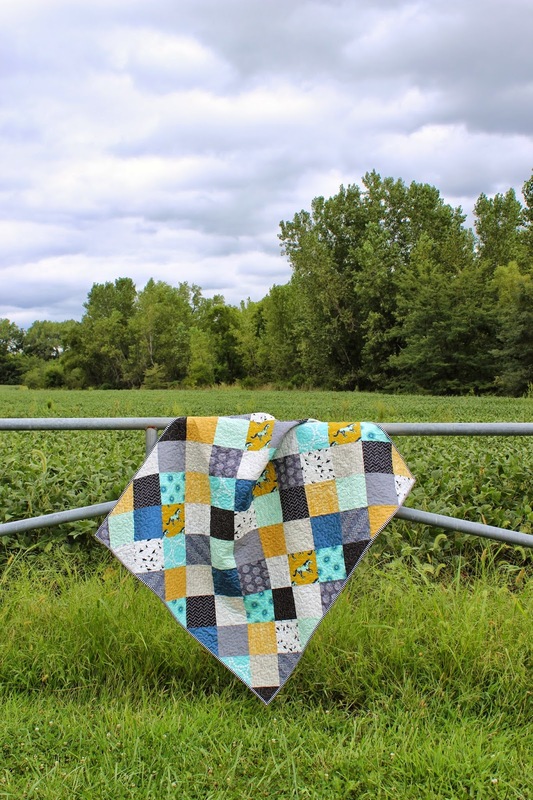 This annual quilt drive is great because it allows you to donate locally to a children's charity of your choosing. 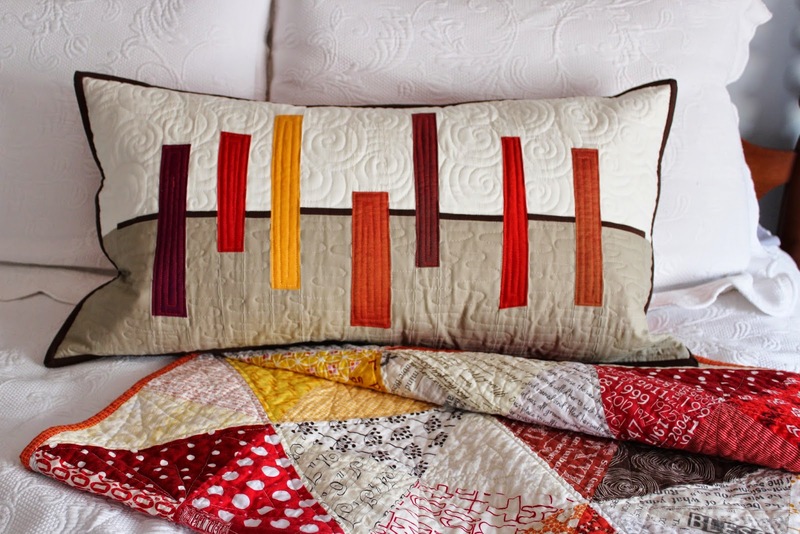 Just add a link to an online photo of your quilt, and you can participate. There are prizes! The link is open through the end of the month, so you still have time. 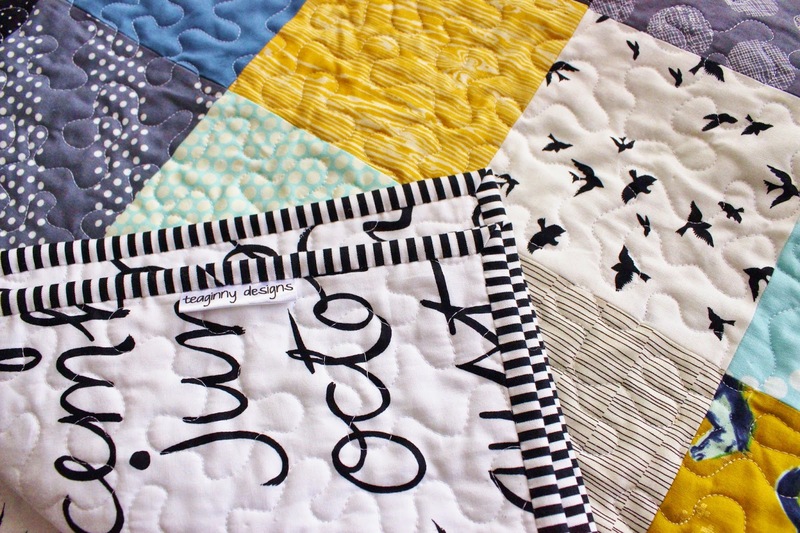 The post even includes ideas for simple quilts to make. Thanks so all my friends who contributed blocks! I know this is going to be well used by some little guy in our community. 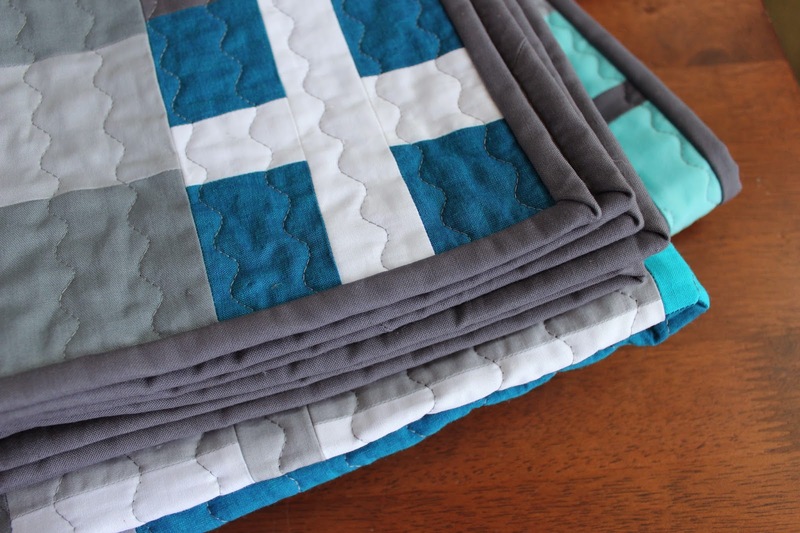 This 42 x 46 baby quilt was a custom design for a friend of a friend. 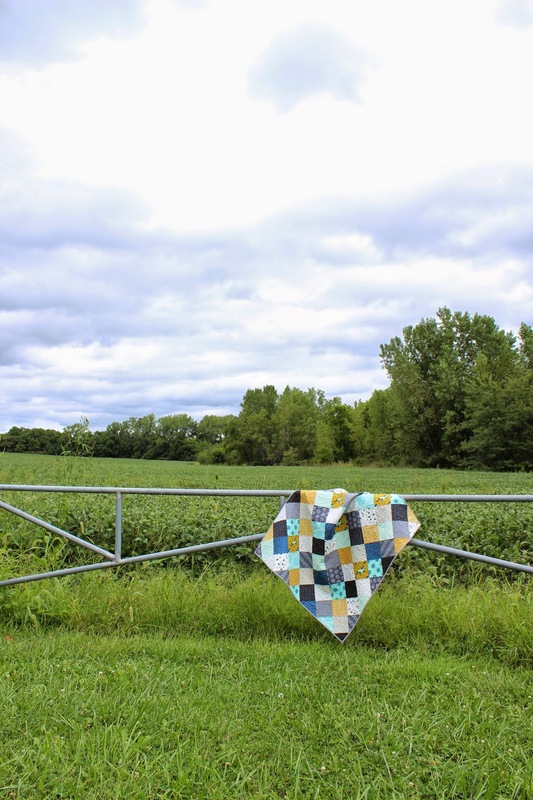 The story behind the quilt is really sweet actually. 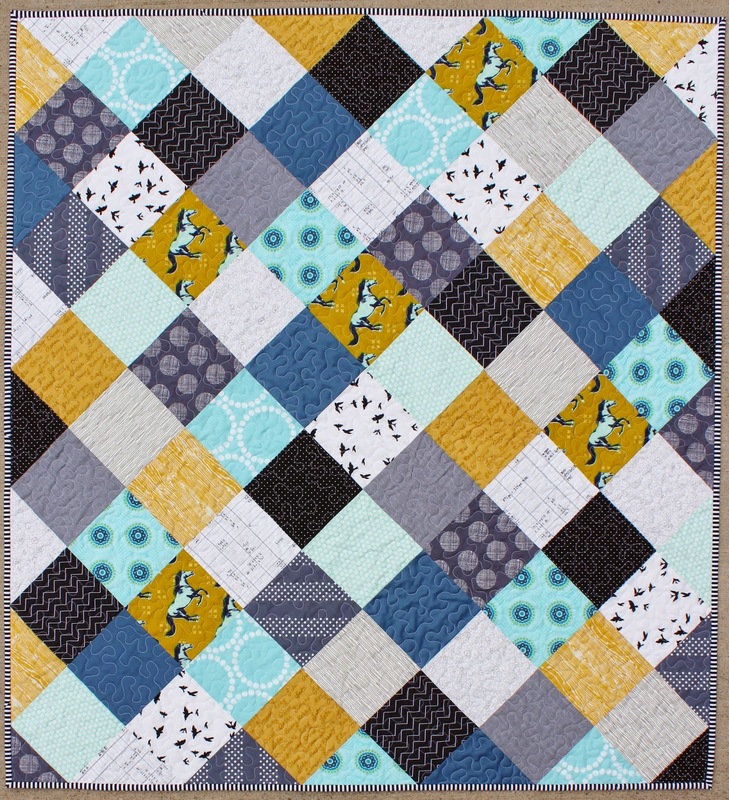 The customer sent me her bridesmaid dress and asked me to incorporate it into a simple patchwork quilt for a friend (the bride previously) who is expecting a baby. 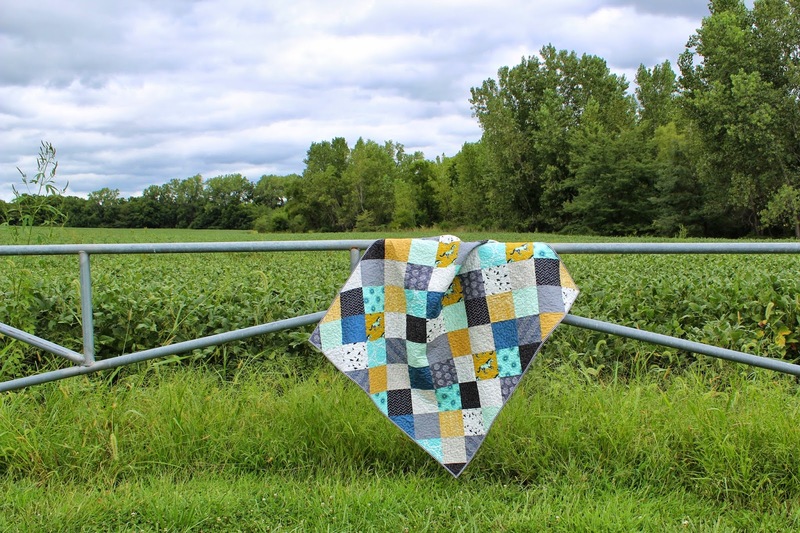 As we discussed possible fabrics, I stumbled upon this wonderful, scrappy patchwork quilt top by Heather on instagram, which we both liked. 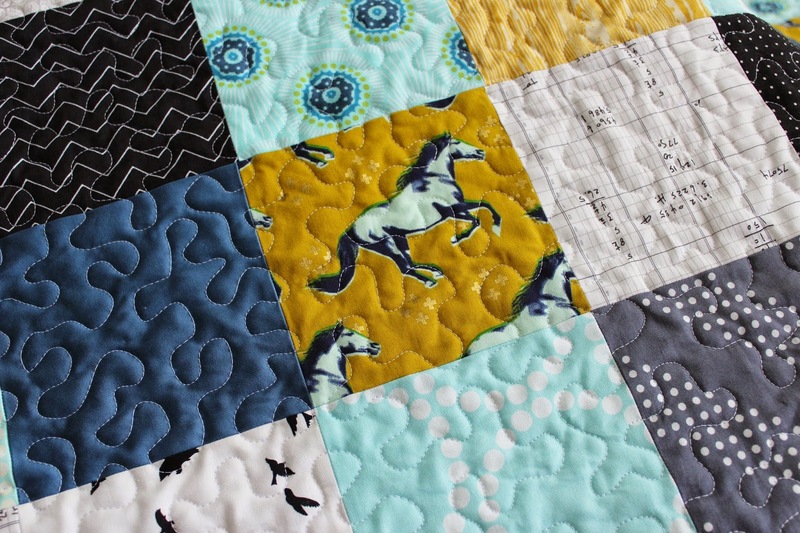 The horse print from Melody Miller's Mustang line for Cotton and Steel was the starting point, along with the blue solid from the dress. I was able to pull the rest from my stash (hooray!). 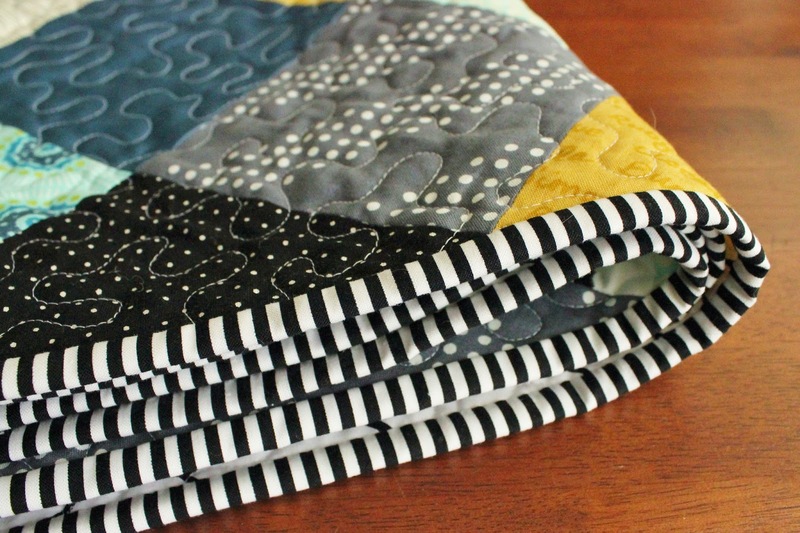 It was so fun to have free rein to choose many non traditional fabrics for a this eclectic quilt. I especially love the ledger print from Architectures by Carolyn Friedlander, the mustard wood grain by Joel Dewberry, and the aqua print from Field Study by Anna Maria Horner. 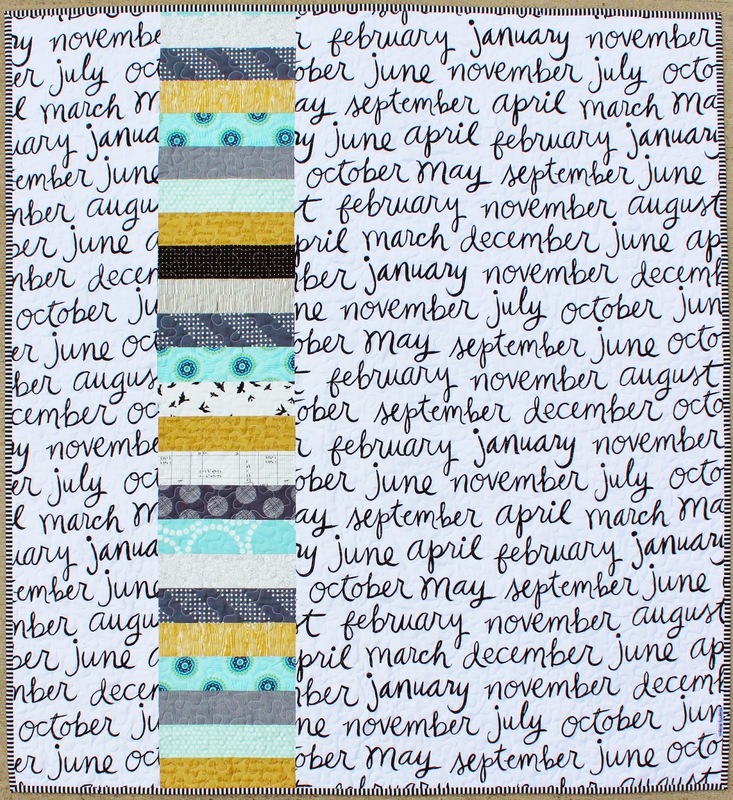 The back is a fun text print and a column of scrap strips. And I think black and white striped binding is almost always a good idea. 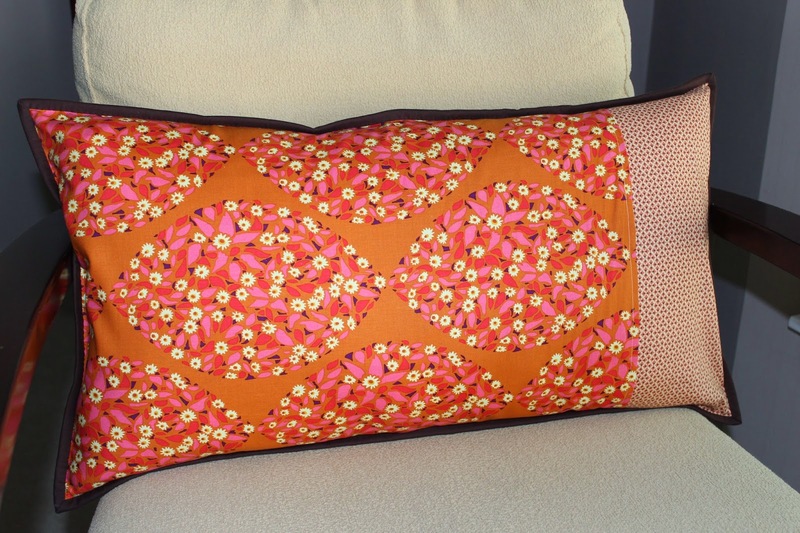 I hope the new mom loves the quilt as much as I do, and hopefully my customer will be pleased with it too. 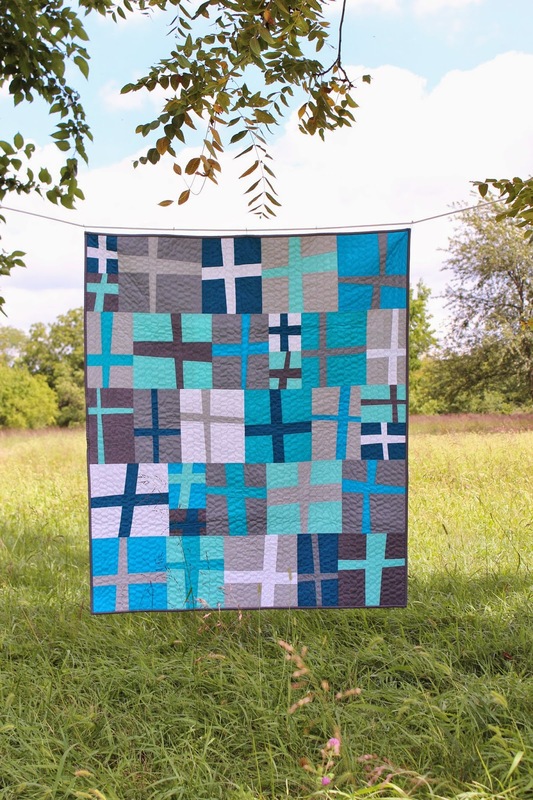 The dress fabric makes this quilt a nice reminder of their friendship.